It’s a blast from the past! 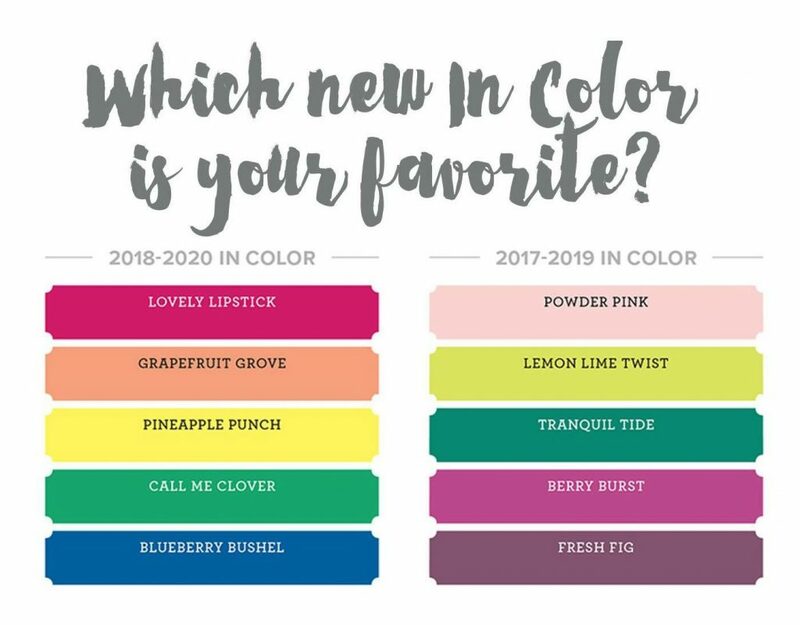 I think that you’re going to recognize a few colors that are making a comback…Mossy Meadow, Poppy Parade, Coastal Cabana, Mint Macaron and Blackberry Bliss (my fav!). Flirty Flamingo!!! Even though it’s one of the in colors, it’s staying (whew) and is moving into one of the color families. Leave me a comment from the above questions on color choices and I’ll put your name into a drawing…the surprise is enticing right? The winner will be randomly drawn and announced on May 11th…my birthday!!! April 9th the Retirement List is out. Accessories are “while supplies last” only. April 9th-the NEW Catalog is available for Demonstrators Only to view online. CUSTOMERS: Yes, this is you!!! May 1-31st Customers can order the “Share What You Love” Early Release Bundles!!! Details and photos to follow soon! 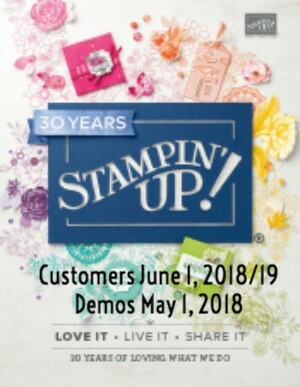 May 15th Demonstrators will get a catalog from Stampin’ Up! NEW Demonstrators who sign up with me NOW will get a catalog in their first Demonstrator Order BUT they can also get products from the Pre-Order list in their KIT for only $99…wowzie! New Demonstrators will also get a box of catalogs included in their KIT!! Below is a Peek of the NEW 2018-19 Catalog Cover–I bet you are wondering how you can get your hands on a copy of this catalog. If you have placed an order with ME, your copy will be mailed to you. If you haven’t placed an order but would like a copy, email me and I will PayPal you an invoice of $7 which will cover packaging and shipping. Become a Demonstrator and you’ll get a copy in your next Demonstrator order–starting May 2nd. The links to the retiring list are below! If you don’t have a Demonstrator…I would love to be yours!!! Sign up NOW for lots of perks and discounts! 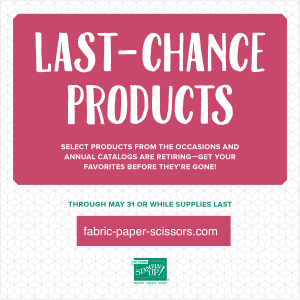 Contact me through my email ca@fabric-paper-scissors or through my Demonstrator Business site. I love the grape and the flirty flamingo. I find all the color changes confusing though. I have lots of old pads that look like new colors with different names. It’s a lot to keep track of. The Grapefruit Grove is yummy and I’m happy that Flirty Flamingo is staying. It’s hard to say goodbye to some of my fav colors but I just love all of the new ones. 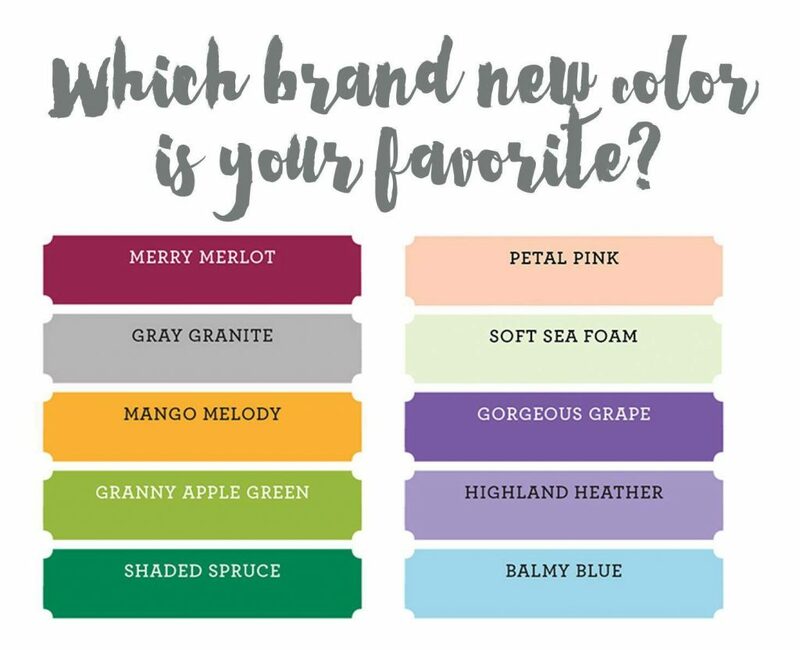 The did bring back a few “oldies” Mint Macaron, Blackberry Bliss, Mossy Meadow, Poppy Parade and I love the new Mango Melody and Gorgeous Grape! 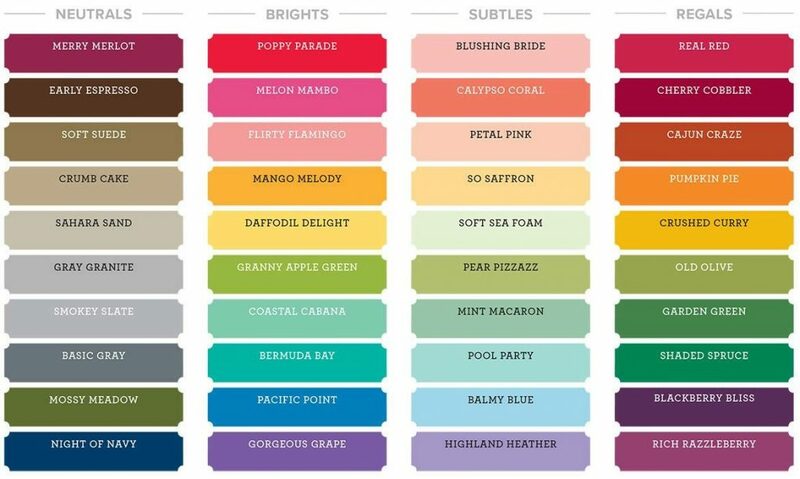 I’ll have ALL of the new colors in my studio next week…pop on over! I love ALL the new colors. Normally I tend to go for the greens (can’t wait to see what shaded spruce looks like in the cardstock) but this time around I am really liking Blueberry Bushel and Gorgeous Grape. Stampin Up hasn’t carried my idea of what purple is until now. I love them too! 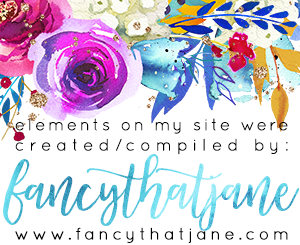 Just got all of the RGB and HEX codes so plan on showing them off in BLOG posts and my Newsletter! Thanks for commenting!! !